Nicolls’ Outpost was the smaller of two forts built by the British in the War of 1812. The site was located in present-day Chattahoochee, Florida. It was built atop a large prehistoric Indian mound in the fall of 1814 by British Lieutenant Colonel Edward Nicolls who was leading an expedition to recruit Seminole Indians and escaped black slaves in Florida to assist them in the fight against America. 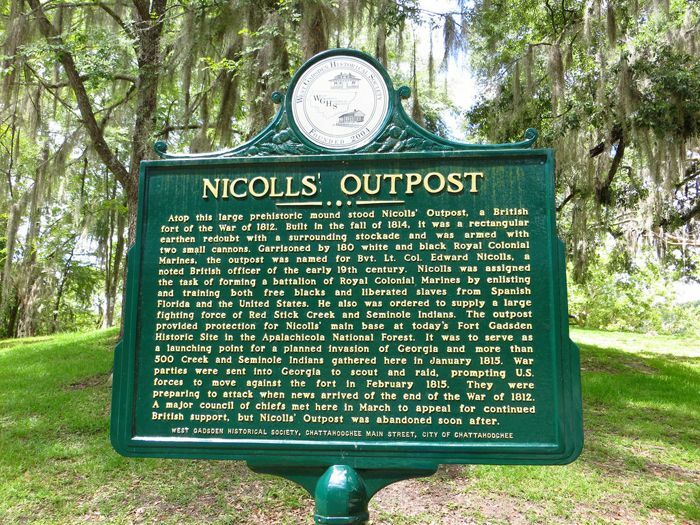 Nicolls’ Outpost, along with with the larger “British Fort”, later called Fort Gadsden, were established during England’s Gulf Coast Campaign along the Apalachicola River. Even though the outpost was smaller than the much larger British Fort down the Apalachicola River, it was intended to be the base for an English invasion of the United States. The Americans referred to the post as Fort Apalachicola. Nicolls’ Outpost was a rectangular earthen redoubt with a surrounding stockade and was armed with two small cannons, that was garrisoned by about 200, white and black Royal Colonial Marines, along with about 500 Creek Indian warriors. It was named for its builder, Brevet Lieutenant Colonel Edward Nicolls, a noted British officer of the early 19th century. 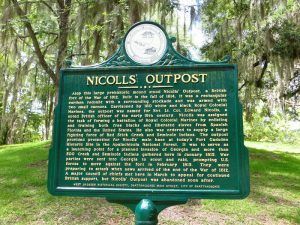 Nicolls enlisted and trained both free blacks and escaped slaves and was allied with the Red Stick Creek and Seminole Indians. His combined forces were planning an invasion of Georgia in February 1815 when they receive word that the War of 1812 had ended. A major council of chiefs met at the fort the next month to appeal for continued British support, but the outpost was soon abandoned. Nothing remains of the fort today, but a historic marker is located is on South River Landing Road half a mile south of West Washington Street (U.S. 90) Chattahoochee, Florida.